On our last trip through the area, we noticed a large, newish-looking sign belonging to a restaurant called Akdeniz Hatay Sofrası. Hatay is the name of Turkey’s southernmost province, an area bounded by the Mediterranean and the border with Syria. Until the 1930s, the Hatay region was actually part of Syria, and the food from there is closer in spirit and flavor to what is found on menus in Aleppo or Damascus. Hatay, the restaurant, is run by a family that hails from the area and does brisk business serving up authentic and very good food from the region. On the several occasions that we’ve been there, the two-floor restaurant was packed with large groups, mostly families who also originally came to Istanbul from Hatay, sitting at long tables covered with countless plates of food. Hatay’s Syrian roots are especially obvious when it comes to starters, where a creamy hummus – an item surprisingly hard to find in Istanbul – and a smoky eggplant and yogurt salad called mütebbel are the stars. Two zesty salads tossed with tart pomegranate molasses – one made with cracked green olives and another with za’atar, a wild herb that tastes something like fresh oregano – are also highly recommended. The extensive main course menu has several kinds of kebabs and a rotating lineup of daily specials, mostly hard-to-find home-style soups, stews and savory tarts. But the menu’s real stars are two show stopping dishes: chicken or lamb stuffed with rice and baked in salt (tuzda tavuk and tuzda kuzu in Turkish), which need to be ordered at least two and a half hours in advance. Slow-cooked in a wood-burning oven, the meat is entombed inside a dome of rock salt and then the whole thing is wheeled to your table on a cart. A waiter then douses the dome with a clear flammable liquid, while another waiter lights it and runs away as the salt erupts in a massive burst of fire that would be the basis of a lawsuit in most other countries, but here is all part of the fun. Once the flames have died down, a waiter returns with a mallet and an industrial sized chisel and cracks open the salt to reveal steaming, succulent meat (and in the case of the chicken, deliciously crispy skin). If you still have some room left for dessert, try Hatay’s excellent künefe, a traditional Middle Eastern sweet made out of a mozzarella-like cheese sandwiched between layers of crispy shredded wheat and doused with a sugary syrup (believe us, it tastes better than it sounds). Hatay is a quick cab ride from Beyoğlu (and even closer to the Sultanahmet area) and we have recently found ourselves going there more and more. In fact, we’re already looking forward to next year’s visit to police HQ. Wow, I’m salivating at the thought of the meat in salt dome. I had fish prepared like that once and it was unforgettable. It has a barely noticeable substratum of brininess, as if the salt has perfumed the meat. I took my family to Hatay Sofrasi after seeing it on your website but we were vastly dissappointed especially with the food. Having spent some time in Hatay, i dont think they could even dare to set up a shop there. Sorry to hear that, Kerem. We’ve always enjoyed the food at Hatay Sofrasi, so we’ll have to go back there and check it out again. Thanks for the comment. this is one of my favorite kebap places in all of Istanbul. been introduced to the place by a friend, i have been there at least five times in the last couple of months. Not a big fan of lamb, i once tried their chicken adana kebap with green olives (one meter kebap) and was surprised how great it tasted. 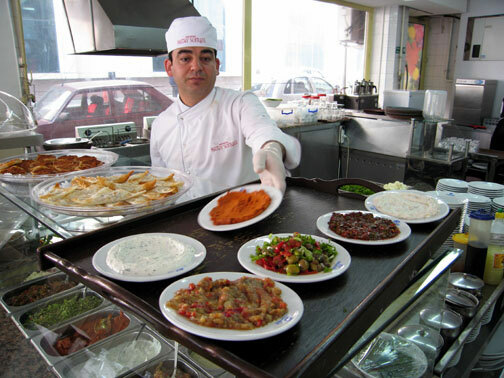 Some salads and cold dishes are Hatay specialities. I personally think that the food is authentic as I have spent some time in Hatay in the past. The waiting staff is very friendly and responsive. Next time, I plan to go back there on a sunday – they claim they have 100 or more dishes for their open buffet sunday brunch. I had a great tour in Turkey last March,including Hatay. Akdeniz Hatay Sofrası was the best stop i had ever been to. Great food with a great service and careful stuff. Chicken in Salt was fantastic. Try it with cold salad plates, which they call meze. Strictly recommended!.. I was surprised to read of künefe containing shredded wheat: wasn’t it kadayıf, shredded phyllo, or is this a regional variant? By the way, the description of tuzda tavuk being served made me laugh out loud! I also wanted to affirm how wonderful this restaurant is. We have Turkish friends in Istanbul and have eaten at Akdeniz Hatay Sofrası on multiple occasions and each time it was a wonderful experience. It is on a main street near one of the large shopping malls and parking can be difficult however the owners were happy to take our car and find a parking spot so we didn’t have to drive around. Now we just let the waitstaff pick the courses for us and we never have been disappointed. We make it a point to eat here at least once each time we return to Istanbul. Great to hear it! It’s a favorite with us, too.